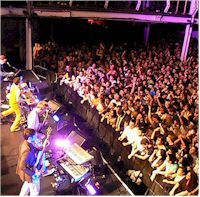 Located in Hell's Kitchen, Terminal 5 is a live performance venue operated by the Bowery Presents, a group stemming from Bowery Ballroom. There are several different sections with a capacity of 3,000. Tickets are general admission, so you have to arrive early to get a spot. The Terminal 5 is one of the top New York City venues for concerts and other events. Don't miss some of the biggest names in music as they come to New York City area's Terminal 5 to perform live.